Description : Un simple jeu de Morpion avec un style rétro. [ENGLISH] I was hesitating to post this game in this competition, but there isn't many participants, so I did it. 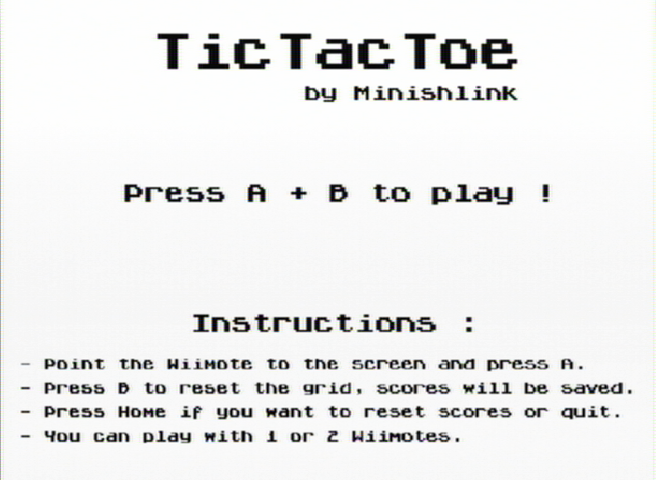 Description : A simple retro style TicTacToe game. Modifié en dernier par minishlink le 01 juin 2009 9:26, modifié 3 fois. Pour ce qui est du faible taux de participation, il faut attendre demain pour vraiment l'affirmer mais dans tous les cas ton homebrew est le bienvenue :). as tu utilisé la librairie que tu propose dans la partie application pour faire ce tic tac toe? Nice to share this link. It is really very useful for those people who have not knew about the installation instruction. I want to update it on my windows . I hope that I will install it as well using the information. Nice job.